BHRE and the Higher Education Procurement Association (HEPA) have joined forces to produce a Guidance for the Higher Education sector to support public buyers in their process of writing their Slavery and Human Trafficking Statement to comply with their obligations under the UK Modern Slavery Act Section 54, Transparency on Supply Chains. This Guidance is part of our efforts towards more responsible social procurement and encourage institutions to respect, protect and promote human rights through their purchasing decisions. This Guidance aims to highlight useful insights and support those responsible for the preparation of their Slavery and Human Trafficking Statement but does not intend to provide a template or a “do this and you will be done with the Statement” guide. As we will see, the Statement should reflect the process of due diligence in your institution and the journey towards understanding your responsibility towards those who provide the products and services you procure. The Statement is just one of the elements of the process, one that should be completed with care, attention and honesty. This Guidance is based on our research and interactions with public buyers. We have kept is short and user-friendly, avoiding overloading the reader with data. In order to avoid providing statements which could be read as templates we have stayed clear of specific examples found in existing Statements. 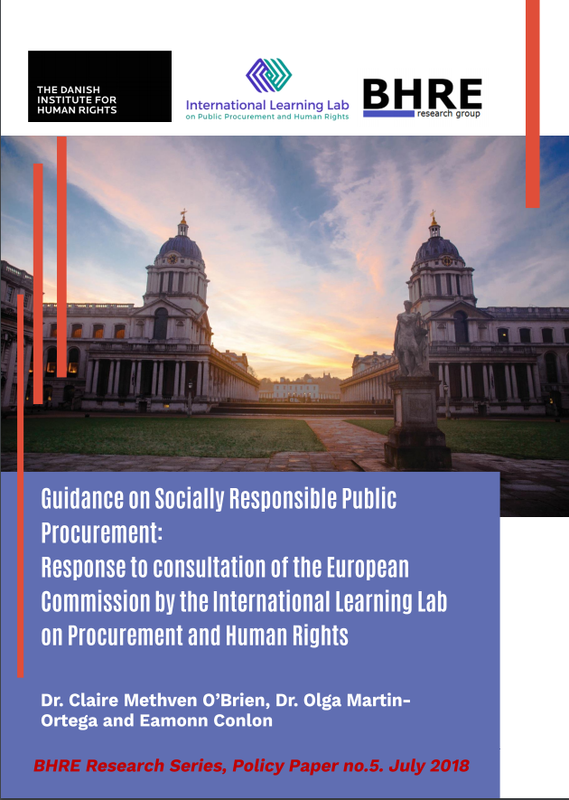 In July 2018 the Learning Lab submitted a response to a European Commission consultation on their Guidance on Socially Responsible Public Procurement. The submission was written by Dr. Claire Methven O’Brien, Dr. Olga Martin-Ortega and Eamonn Conlon on behalf of the Learning Lab and has now been published as BHRE Research Series Policy Paper n. 4. In this paper we propose a series of recommendations to the European Commission and suggest a new concept of Socially Responsible Public Procurement. There is a pressing need for guidance and capacity development support for EU public buyers on techniques and tools they can lawfully deploy to avoid or reduce the incidence of human rights abuses in the delivery of government contracts. Such guidance should address how public buyers may lawfully require suppliers to undertake human rights due diligence, how they should monitor their supplier’s performance in addressing human rights risks in the supply chain, and how and when they should apply sanctions to suppliers that fail to implement the ‘corporate responsibility to respect’ human rights. government spending, this presents a concrete and substantial threat to the realisation of the “decent work” agenda, the UNGPs and the Sustainable Development Goals, worldwide. EU public procurement laws and policies as well as government purchasing practices should safeguard human rights. They should further yield a competitive advantage to companies that practice human rights due diligence as a mechanism to advance their operation on a socially and environmentally sustainable basis. Standards and guidance on supply chains and human rights including the OECD Guidelines for Multinational Enterprises (2011), OECD Due Diligence Guidance (2018), OECD sector specific due diligence guidance and ISO 20400 Sustainable Procurement Guidance. A strategic objective of EC SRPP guidance should be to enhance the use of EU government buying to increase the practice of human rights due diligence by businesses, in line with the UNGPs and OECD Guidelines for MNEs, and hence to increase business respect for human rights. ‘SRPP’ means procurement operations where human rights are respected and which promote sustainable development and responsible business conduct through the practice of risk-based supply chain due diligence to identify, prevent, mitigate and remedy potential and actual adverse impacts on human rights as well as environmental and social concerns. SRPP operations may also seek to promote, for example, employment opportunities, decent work, compliance with social and labour rights, social inclusion (including persons with disabilities and migrant workers), equal opportunities, accessibility design for all and ethical trade, in addition to observing the principles enshrined in the Treaty for the European Union (TFEU) and the Procurement Directives. develop, implement and keep updated appropriate policies and procedures including: a company policy or other commitment to respect human rights; due diligence to identify, prevent, mitigate and account for how they address their impacts on human rights, and processes for remediation of adverse human rights impacts to which they cause or contribute. 2. A clear statement of the state duty to protect against business-related human rights abuses in the procurement context, indicating its non-discretionary character, and an exposition of its implications for the interpretation and practical application of the EU public procurement Directives. 3. A clear explanation of “human rights due diligence” as a standard of conduct expected of all businesses including government suppliers and their business partners. 4. Guidance on how to integrate human rights considerations into SRPP policies at national and local levels. 5. Practical guidelines for public buyers on how to make effective use of the scope provided by the 2014 EU Procurement Directives to integrate human rights considerations across the public procurement cycle, including planning, tendering, contract monitoring and evaluation phases. 6. Examples of good practices in integrating human rights into public procurement. 7. Case studies addressing a selection of high risk sectors for human rights abuses in the EU public procurement context, such as catering, food and agricultural supply and garments supply chain, electronics and construction. 8. Guidance on addressing perceived tensions between measures to protect human rights and other ‘primary’ or ‘secondary’ aims of public procurement, such as promoting the accessibility of public contracts to local and small and medium-sized enterprises (SMEs) or anti-corruption. 9. Finally, as the UNGPs are concerned to advance effective enjoyment of universally-recognised human rights, new EC SRPP guidance should clarify that appropriate measures to protect such rights serve to advance, rather than undermine, the achievement of a single procurement market. Dr. Johanna Hoekstra has presented the paper "Reporting as a Means to Protect Human Rights: The EU Directive on Non- Financial Reporting" at the International Conference on Business and Human Rights in Sevilla, Spain ("El I plan de acción nacional sobre empresas y derechos humanos" Evaluación, Seguimiento y Propuestas de Revisión), last June. Her paper, co-authored with Dr. Olga Martin-Ortega, analyses the implementation of the Directive 2014/95/EU on disclosure of non-financial and diversity information by certain large undertakings which entered into force on 6 December 2014 from a comparative perspective. This work is been developed in the framework of the larger work on Transparency in Supply Chains undertaken by the BHRE. The program of the Conference is available here. Dr. Olga Martin-Ortega was a member of the Scientific Committee of the Conference.